The Cherry Tree was the second Limited Edition Rare to be released on Habbo and it was available from 5th April 2012. Similarly to the Black Leviathan, the Cherry Tree's original Catalogue price was 75 Credits, but it had 250 more units available making 1000 units overall; all of them sold out later that day and made way for the release of the Black Scifi Pod the day after. Unlike the Black Leviathan, the Cherry Tree was given positive reviews due to the number of rooms it would look suitable in and how aesthetically appealing it was, although visually inaccurate and members picked up on this. Habbo Council members voiced their opinions saying it should be named 'Sakura Tree' as it looks more like them than a cherry tree. 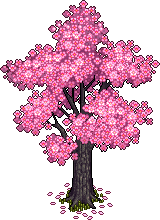 Although it was never renamed, Habbo released an item called the Sakura Tree for Valentine's 2015 in a room bundle; if a player purchased it, they received 3 Sakura Trees in it. Originally, it was thought that this would decrease the value of the Cherry Tree, but the value stayed and it continued to be worth exceptionally more than its release price of 75 Credits. This page was last edited on 21 April 2019, at 23:15.